What to Teach in the RCIA? In a typical parish RCIA setting, we are given very little time to catechize in proportion to the beautiful depth of each truth of the faith. With such limited time, with so much to learn, what must I teach? What do they have to know? The premise of the doctrine is the underlying truth upon which the doctrine is based. 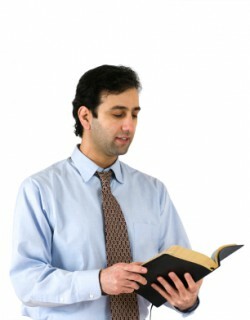 For example, for the doctrine of Faith, the premise would be: "We believe because of the authority of God who reveals. He cannot deceive nor be deceived" (Catechism #156). For Scripture, the premise would be "God has chosen to speak to us in human words. He is the author of these human words" (Catechism #105). By conveying the premise from the get-go, the catechumens/candidates will have little lights go off in their minds as they come to grasp with the intellect the rhyme and reason behind this particular doctrine. The premise should be very short and sweet. The Catechism of the Catholic Church is an excellent resource to use to find the premise underlying this or that particular doctrine. The essentials are those aspects of the doctrine, which cannot be left to chance that the students will get them on their own. Let's return to the example of Faith. Faith (1) Is certain. (2) Necessary for salvation. (3) Seeks understanding. (4) A gift. (5) Can be lost and increased. Like for the premise, you can find these essentials by using the Catechism of the Catholic Church. For these 5 essentials on "Faith," look at paragraphs 153-165 of the Catechism. For the doctrine of Scripture, three essentials are: (1) The human authors are true authors, so Scripture has a very human element to it, though without error. (2) The Magisterium is the authentic interpreter of Scripture. (3) Christ is the center of all of Scripture. Insufficient or ineffective catechesis has left many participants with a false understanding of the doctrines of the Catholic Faith. When we catechize, we should teach those misunderstandings so as to clear them away. With regard to Faith, many often think it is a "blind leap." Not so. Our faith has very good reasons upon which it rests, and there are many evidences that underly what we believe. Take the Resurrection for example. There are many very good reasons that we believe Jesus was raised from the dead. The Catechism calls these reasons "'motives of credibility' (motiva credibilitatis), which show that the assent of faith is "by no means a blind impulse of the mind." For Scripture, many have come to believe that Scripture is the only source of God's revelation to us. We need to show that there is another coequal channel by which God's divine revelation comes to us, and that is Apostolic Tradition (See Catechism #74-83). All doctrine is grounded in Sacred Scripture. Many Scripture passages enlighten our understanding of a particular doctrine. We should be constantly turning to Scripture and allowing for the Word of God to under gird everything we teach. Faith: Hebrews 11:1 - "Now faith is the assurance of things hoped for, the conviction of things not seen." Scripture: 2 Timothy 3:16 - "All Scripture is inspired by God and is useful for teaching..."
The Deposit of Faith is an organic unity. The doctrines of the Faith are not independent of one another. Often, the teaching of a related doctrine will reveal to a participant what had been previously hidden. By teaching in an "integral" fashion, the catechumens/candidates will get so much more out of the catechetical sessions, and an excitement will soon begin to buzz among them as they grow in their understanding. Jesus is the perfecter of our Faith. By Prayer, we can increase in Faith. Mary is the perfect role model for the life of Faith. The Church hands on the Faith. Faith is necessary for Salvation. Scripture together with Tradition makes up the single sacred Deposit of Faith. Reading Scripture can give increase to one's Faith. The Church determined the canon of Scripture. The Trinity is the principal author of Scripture. Scripture was written for the sake of our Salvation. To learn about how to devise a curriculum for the catechumenate, see the blog entry titled: "Catechesis in the Catechumenate."